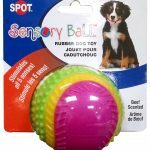 The Ethical Pets Sensory Ball Dog Toy is designed to engage ALL of your dogs’ senses. 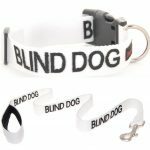 If your dog is blind, and I’m guessing that’s the case if you’re at this website, this is the perfect kind of toy for your dog. 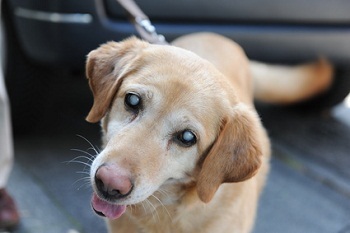 Your dog may no longer have the sense of sight, but his or her other senses will more than make up for it. They will enjoy being able to track the ball using their other senses and if your dog loves playing fetch, this is a MUST. Aside from the vibrant colors, the internal sound bell and squeaker engages your dog’s sense of hearing. Sound making dog toys are great because it allows your dog to track the position of the ball while playing. It also allows them to know when it stops moving. The slight beef scent and flavor of this ball also engages your dog’s senses of smell and taste. The smell is not overpowering, which is great for us humans. 😉 If they lose the ball with their hearing, your dog will also be able to track this ball by scent. And once they find it, well, they’ll get a taste treat! The ball also features a variety of textures for gripping and chewing, engaging their sense of touch. This toy gets high marks as a toy for blind dogs, but it comes with some caveats. This ball is not for heavy chewers. The layers of the ball can be peeled away with vigorous, heavy chewing, which could pose a choking hazard. If you have a heavy chewer and want to try this toy out, I would suggest only allowing your dog to play with it while you supervise. Beef flavor is a treat once they find it! The Ethical Pets Sensory Ball Dog Toy is available at Amazon. Click the buy button below to be taken right to the detail page to purchase. 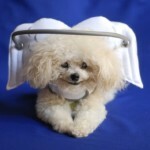 If you have this product and would recommend it or know somepup it would benefit, please share this post!